Click this link below for some great information to assist you on your quest to join the WINNERS CIRCLE! For only $250 you can get your foot in the game and own a portion of not one, but two! Standardbred race horses! Get in on the club! 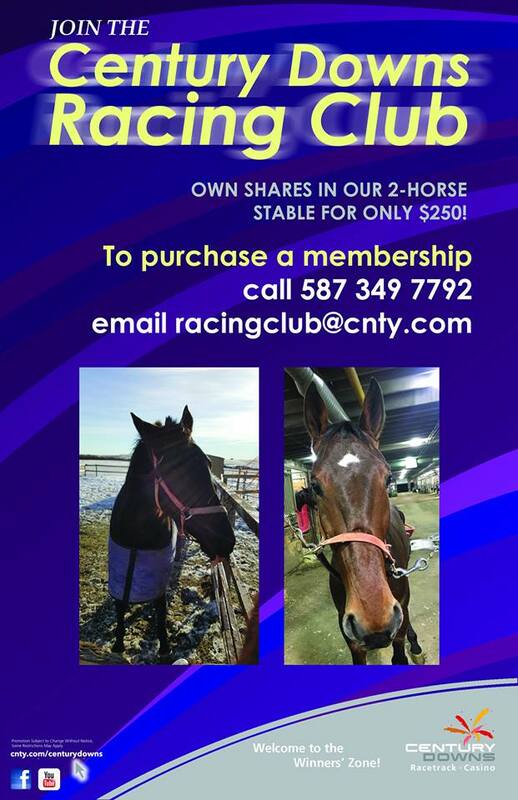 Join the Century Downs Racing Club to own shares of our stable! See what it takes to become a horse owner! If your are already interested in becoming an owner outside of the club, please stay tuned as we update this page or contact the ASHA office to talk to someone about being an owner! A effort by a trainer and training stable to bring new owners and horses into the stable. This reduces the risk of a trainer being too dependent on a small group of owners by adding new interested owners. Lower cost of entry into ownership buying a piece of a horse rather than the whole thing. Ability to go as fast or slow as you want growing investment in race horses. Ability to discuss concerns with co-owners. Usually have less control in selection of horses than a high interest owner. Less control in managing the race horse with more power to the trainer. Any trainer considering a fractional ownership stable needs to put together a plan that sets targets for number of horses, types of horses and number of owners. Another consideration is the make up of stables. Will there be one per horse, one for a group of horse and of course how big or small to make the fraction owned. Finally how much will the trainer retain of each horse and charge for administration and overhead. The onus will be on the trainer and their staff to sell the fractional stable concept to prospective owners. Presentation materials and a breakdown of whats involved with training and racing horses will be helpful especially with new owners. The stable will require good management skills including regular written and verbal communication with ownership groups, accurate reporting and accounting records. prompt invoicing and the ability to collect on outstanding invoices. You need language in stable agreements that leave final decisions with the trainer recognizing that they will need to take the time to explain the reasons for making decisions to the owners. Solicit the help of Century Downs and/or ASHA to set up an event for prospective new owners interested in fractional ownership. This is where trainers will build relationships with prospective fractional owners so it is vital that the communication is excellent and that there is management of expectations and cautionary language that will narrow down lists of prospective owners to those with the ability to take the highs and lows of horse ownership. With a group of prospective owners, determine how much capital they have for initial investment and how they will keep up with monthly bills. Communication is again important as trainers discuss type of horses targeted, expected acquisition cost and expected monthly net cost/benefit of racing. From there it is getting the stable(s) organized. Collecting initial payments. Registering stables. Finally discussing and executing on horse acquisitions. The client (fractional owner) needs to be treated with respect, concerns need to be addressed, changes in their horses condition needs to be communicated and options discussed. If a trainer and his staff can develop a bond of trust with the fractional owners and deliver some measure of success there will be opportunity for growth.